HP Newquist, executive director of the National Guitar Museum, sits atop the world's largest guitar. 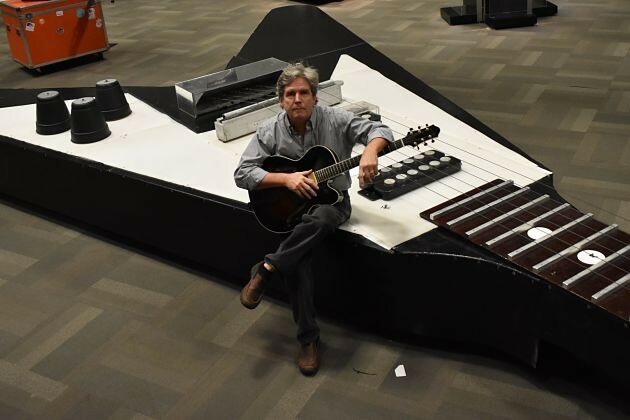 The world's largest playable guitar, measuring 43 feet by 16 feet and weighing in at more than a ton, was crafted in the mid 2000s at a science academy in Houston. Certified by the Guinness Book of World Records, the behemoth six-string currently sits in a room at the St. Louis Science Center. Naturally, it's a Flying V.
"It sounds more like a UFO crash-landing," HP Newquist says as he smacks the oversized instrument's heavy strings, producing a racket that does indeed sound otherworldly. "But it's still in the Guinness Book of Records — it was actually featured again last year in the actual published book. "People will come and they will want to play it, but they will probably end up sitting on it, walking on it and taking selfies on it," he adds with a laugh. "We've had kids doing tightrope walking on here." Newquist, the New York City-based executive director of the National Guitar Museum, knows a thing or two about guitars. For years in the '90s he served as editor in chief for Guitar Magazine; he's also written several books on the subject, including Legends of Rock Guitar, Acoustic Masters and Metal Masters, just to name a few. But it's a traveling guitar exhibit entitled Guitar: The Instrument That Rocked the World, which opens Saturday at the Science Center, that has brought him to St. Louis this week. 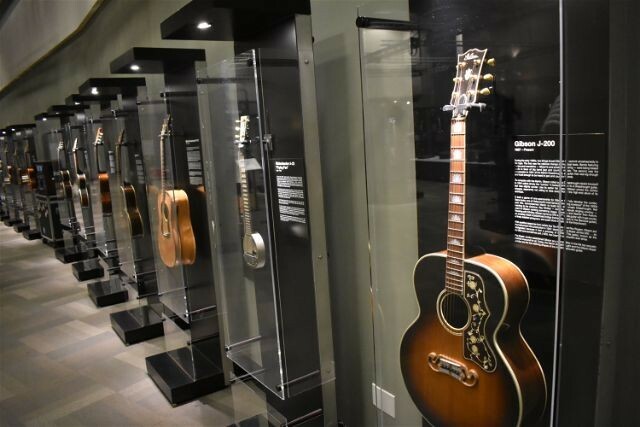 The public display sprawls across 7,000 square feet of the building, including more than 80 guitars with varying levels of cultural and historic significance as well as more than twenty interactive displays. "We currently have two exhibits on the road," Newquist says. 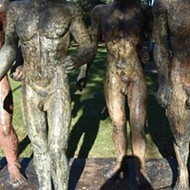 "The other one is an art museum exhibit. Between the two exhibits it's about two thirds of our collection; the other third is in a Connecticut warehouse. And we have no permanent home yet, because every time we plan on moving into a permanent home all the exhibits get booked again." It's a good problem to have, he reasons. 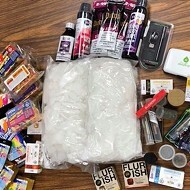 Being in demand has brought the collection to 24 different states. It's been deployed to look at guitars from every perspective, from the history behind them to the science that goes into creating them and enabling them to make sounds to the pop culture effect that they've had on society for more than 500 years. The exhibit traces the history of the instrument from its oldest ancestors, such as the nyatiti and the tanbur, to the advances of present day. "What we talk a lot about in this exhibit is the science of sound," Newquist explains. "People will experience different decibel levels, they'll be able to hear how things relate from a decibel standpoint, they can see soundwaves captured in a tube, they can create their own tones using a frequency wheel and tubes. The science of sound behind the guitar is really what drives this particular exhibit." It's also driven, of course, by a whole slew of really damn cool guitars, including Steve Vai's first JEM, Joe Bonamassa's Electra-Glide, a Lucille from B.B. King and a signed Tony Iommi signature SG. But Newquist is quick to point out that those guitars owned by famous musicians are not, to his mind, the exhibit's main draw. 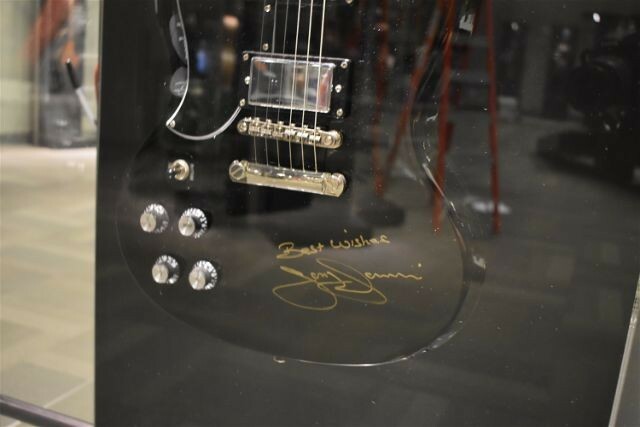 One of Tony Iommi's signature SGs, signed by the Black Sabbath rocker. "For us it's more important to show that, here's a Stratocaster. Here's why Eric Clapton, Jimmy Hendrix, Jeff Beck, Stevie Ray Vaughn, Buddy Guy — why those guys played this guitar," he says. "It's not really about the players and the names, it's about why the instrument is so important, in and of itself. Its design, the way the pickups were created, the shape, who created the shape." To that end, the evolution of the instrument is a key part of the show. Newquist points to a Fabricatorie six-string from 1806. The Naples, Italy-based Fabricatorie family was the first to conceive of the guitar as a dedicated six-string instrument; beforehand, guitars ranged anywhere from six to sixteen strings. The family noticed that more people were playing six-string guitars than any of the others, and made it their standard. The one on display is one of only seventeen left in the world. Another interesting piece is the Rickenbacker Frying Pan, created to play Hawaiian music, which was the most popular music in America in the 1930s. George Beachum, an American bandleader and guitar player who tired of being drowned out by the rest of his band, mounted magnets to the guitar, which ran to radio speakers, amplifying its sound. Since then, Newquist explains, every guitar manufacturer has tried to make their guitar the loudest. That brings us closer to the modern era of the guitar as a dominant feature of rock & roll. The exhibit features a Fender Telecaster, the first mass-produced Spanish-style guitar — one that is slung across the chest rather than held on the player's lap — which debuted in 1949. Its introduction led directly to the creation of country and rock & roll music, Newquist says. He notes as an interesting aside that its creator and namesake, Leo Fender, never learned how to play the guitar — or even tune it. "More guitars in the world have his name on it than any other person," he says. "Didn't know how to play." Newquist, meanwhile, has played for more than three decades. He says the roots of the National Guitar Museum, and by extension this exhibit, trace back to 2008, when a friend came to his house and marveled at the sheer number of guitars within, remarking that his home was akin to a guitar museum. That got Newquist thinking: Is there a guitar museum out there somewhere? "There are several barbed-wire museums. There are several ventriloquist dummy museums. There are teacup museums. But there were no museums dedicated to the guitar," he says. "So I got together with some partners and we said, 'Let's start a museum.' Ten years later, here we are." The walls of the exhibit are lined with guitars from throughout history. 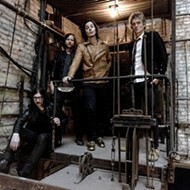 There are some who say guitar-based music is going by the wayside in recent years, replaced by an ever-increasing number of synthesizers and studio effects and computer programs like Ableton Live. Newquist takes issue with that characterization. He points out that in the days of disco, the guitar was also deemed dead. "Certainly electronic and hip-hop and trip-hop and all that stuff is very popular," he concedes. "But if you look at the music of the people who are charting, outside of hip-hop, you know, Taylor Swift plays. Taylor Swift was endorsing Gibson. Ed Sheeran. Any number of 'band' bands — Imagine Dragons, all those guys. Look at the popularity of Queen once again, with Bohemian Rhapsody. A lot of the history of the guitar is cyclical. "You'll read that sales of electric guitars have declined over the years," he continues. "What you don't read is that sales of acoustic guitars have actually increased. And so, overall, people are still buying as many guitars as they've always bought. In America, every year 3 million guitars are sold. Three million! That's more than all other instruments combined." Newquist hopes that Guitar: The Instrument That Rocked the World will help bring attention to the history and dramatic cultural significance of the guitar. And, of course, this being the Science Center, he wants people to get a scientific education on the subject as well. "I'm very happy if somebody walks out of here learning one thing," he says. "If they learn a ton of things, great, but if they walk out and go, 'Wow, that's something I never knew before,' then we have done a good job." Guitar: The Instrument That Rocked the World will run through April 14 on the first floor of the St. Louis Science Center (5050 Oakland Avenue, 314-289-4400). Tickets are free for kids under four and $10.95 for adults. For tickets and more information, visit slsc.org.